Well, what can we say? 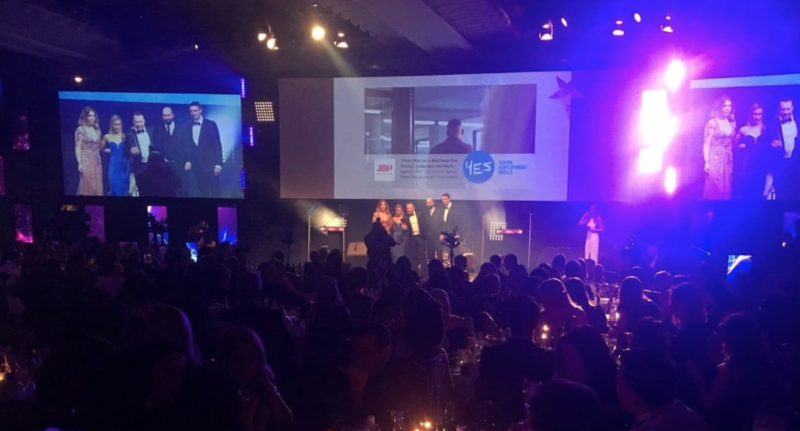 Last Thursday, the Chartered Institute of Marketing (CIM) held its annual Marketing Excellence Awards ceremony at London’s Grosvenor House. We’re delighted to announce that we brought home Best Use of Social Media. Who did we beat? Only Facebook – no biggie. The CIM awards ceremony, hosted by Katherine Ryan, saw marketers from all over the world come together to celebrate their achievements and the moments that helped shape conversation in the industry over the past year. Our campaign with The Wall of Comedy boys beat off strong competition including De Montfort University, the National Gallery, Boost Energy Drinks, Filippo Berio and even Zuckerberg himself. To say we’re feeling excited is an understatement. Not all campaigns have big, glossy budgets. We’re proud to work with some huge global brands but we are equally proud to work closely with niche organisations to make their brands and campaigns stand out creatively. Umbrella brand Reed in Partnership gave us total creative freedom to develop the campaign and select the most effective channels. Opportunities like this don’t come along often in our industry and we were excited to be offered a blank canvas and work with an inspiring nonprofit brand we were confident people would be interested in. Our target audience of young BAME Londoners are difficult to reach and harder to engage. We had to attract their attention in a way that was relevant, authentic and inspirational. We believe that influencer marketing only works in the hands of the right influencer; not just someone that the target demographic recognises, but someone they identify with and trust. We knew that getting the right influencer on board would bring a level of reach and credibility to the campaign that we couldn’t achieve on our own. We thought it was going to be difficult to persuade a government-backed initiative to work with such an edgy influencer but the client could see the value of working them immediately. The team trusted us with our edgy idea and it paid off big time. So well done to us! Another awards ceremony, another well-deserved hangover. We had a fabulous night with Reed in Partnership, eating, dancing and partaking in the occasional orange juice. Victories like this really spur us on. We’re committed to the cause and can’t wait to see how our campaigns will shape up over the next year. Well done to all of the night’s winners – there were some truly incredible work on display and we feel honoured to be counted among the established agencies and brands represented in the Grosvenor last Thursday. Looking for some award-winning content for your brand? Get in touch with our content marketing team and let’s get cracking – next year’s awards season is only 12 months away! Is voice search the future of content marketing?